From left: William Buzo, Eric Tresh, Robert Howren, Patrick Evans, Liz Cha, and Walter Doggett. 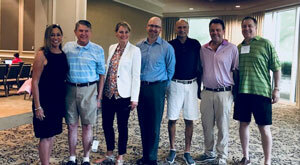 The 2018 TEI Region VIII Annual Conference was held at the beautiful Westin Hilton Head Island Resort in South Carolina from June 6 to 10 and was attended by over 100 TEI members from sixteen chapters (some coming from as far away as Denver) and individuals from member companies. Two major topics dominated the agenda: the impact of tax reform and the automation of the tax function. TEI members received eighteen hours of CPE/CLE over the three days and were treated to world-class speakers. From left: Handy Hevener, Fred Wallach, Robert Howren, Jim Kennedy, and Melinda Kennedy. One discussion item was the value of TEI membership, from education to networking to advocacy. 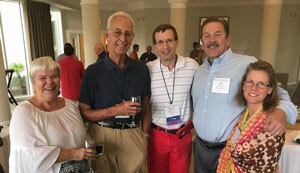 During the conference, four nonmember attendees were so inspired that they joined TEI. In addition, the conference raised over $1,000 in donations to support the Children’s Miracle Network on behalf of TEI Region VIII. Region VIII can’t wait till next year and advises everyone to mark his or her calendar for the 2019 TEI Region VIII Conference, scheduled for June 26–30, 2019, at the Westin Hilton Head Island Resort. From left: Ellen MacNeil, Owen Autry, April Estes, Ben Rohrer, Mitch Trager, Bruce Ely, and Steve Taplits. Special thanks to all forty sponsors of the conference that make this event affordable for members and their families!